The Brandywine Valley Friends of Old Time Music (“BFOTM”) was founded in 1972 by a small group of traditional American music devotees. Carl Goldstein and Shel Sandler, two young Delaware lawyers and budding musicians, had begun playing informally with a local autoharp player, Mike Hudak, who was a protege of Kilby Snow. Kilby Snow was a brilliant autoharpist from Fries, VA who had moved to nearby Landenberg, Pennsylvania. While there had been occasional concerts in the area for many years, most notably in the summer at Sunset Park in Oxford, Pennsylvania, there was no continuing program and no coordination of efforts. The three founded the BFOTM to attempt to expand regional interest in traditional music. They had taken note of an indisputable geographic fact, the location of Wilmington, Delaware near a major north-south route, Route 95. This, coupled with the proximity of the region to Sunset Park and several other country music parks that occasionally booked traditional musicians, as well as to the Washington, DC area, which had become a center for Bluegrass bands, afforded an opportunity to arrange several concerts featuring performers passing through the area. In this way, a nucleus of interested persons was located and a nonprofit Board of devoted traditional music lovers was established. The BFOTM has continued to present an extraordinary variety of traditional musicians to Delaware and regional audiences for over 30 years. During the winter months in the early years, the BFOTM sponsored concerts by the Balfa Brothers and their Cajun music, several Bluegrass bands, old time fiddlers and banjo players, and blues musicians. Beginning on Labor Day weekend of 1972, the Friends, in cooperation with Bill Monroe and Ralph Stanley, established the Delaware Valley Bluegrass Festival, which has since become an annual event drawing thousands of visitors from throughout the country to hear the finest in Bluegrass music. 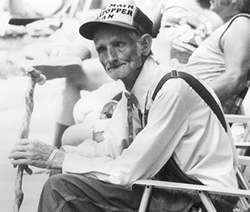 In 1974, after their efforts to include old time bands in the Bluegrass Festival were rebuffed by Monroe and Stanley, the BFOTM decided to hold a July festival focused on the preservation and presentation of old-time music. Old-time music, sometimes called “old-time country music,” “mountain music,” “Appalachian string band music,” or simply “country music” by people of the area, is the rural music rooted primarily in the central and lower portions of the American Piedmont. Of course the definition can easily be widened to include the music of the American south encompassing the area south of the Mason-Dixon Line all the way to Texas. The music includes primarily the ballads and instrumental music (often called, simply, fiddle music) brought by American settlers from the British Isles. A large concentration of these families settled in the America Piedmont, especially in the central section of the Appalachian mountain region. The Brandywine festival was perhaps the first of its kind in America to have a yearly, shifting focus on a variety of regional, geographic, and stylistic musical themes. Yearly themes included the music of West Virginia, Virginia, Kentucky, Tennessee, Missouri and Texas, French Music In America, Early Country Radio, Women In Old Time Music and even Humor In Old Time Music. After 20 years, Brandywine was suspended due to a shortage of funds, but it had served its original purpose of revitalizing traditional music and creating a whole generation of enthusiasts who carry on the music today. And due to the dedication of one man, the late Louis J. Philipp of Paulsboro, New Jersey, the music that was presented on stage at Brandywine has been preserved. Lou Phillipp attended and recorded the Brandywine festival for its entire duration, as well as many concerts sponsored by the Brandywine Friends. His work provided the source material for this project. Especially in the early days of the festival, field recording was a much more expensive endeavor than it is today, yet Lou had the foresight to record the performances in their entirety, providing us with a wonderful library of audio documents.